Originally Posted by Billy L.
You could try goiing into your control manager file and clicking on the icon in that list that look like the one you get when you try to access your CD burner. Once there, click on that icon and will probably let you know that you might need to update the specific driver for your CD burner. There may be an option to do just that (update driver). Once you have it (the new driver/info) install it and re-boot your computer. (Note) ...that's jusst one option that has worked for me, via information from other users of theis site.) If there are any other icon's like the one you get when you access your CD, click on those as well, to find out what is needed to activate them properly. Hope this works for you. Have a good day. Thanks heaps, all is now working properly, but I bet something else will go wrong now, lol!!!!! Supersparks posted this some time ago. Here's his link about Testing PSU voltages. 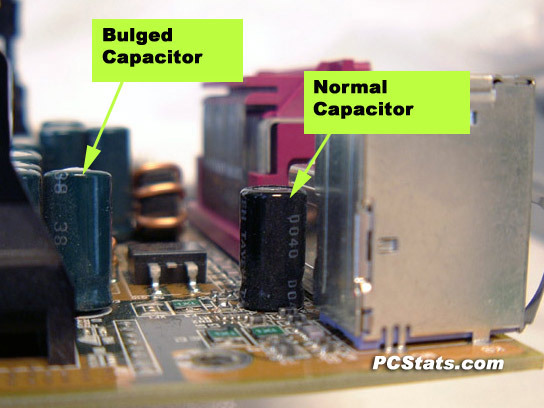 Also, while you've got the covers off the case, carefully check the capacitors for leaks or bulges - there has been a spate of capacitor problems in recent years (a bit of industrial espionage that went wrong ). I've seen too many like those in the last few months. And I understand that a "Poor" PSU will hasten the process. Well, after I replaced the motherboard (Which looked worse than this.. I wish I took shots) in a machine and had my head behind the machine to make some USB connection the PSU just went "BANG". I opened it up and The PSU had leaky capacitors as well. I can just as well also recommend that you look at the voltage on the power outlet. You see, I could compare exact twins (exact same configurations, same mobo, same PSU.. etc). I had gotten curious and eyeballed the twin in another location. It showed nothing amiss. This other family had no problems for many years, but they moved less than two years ago. They now live next to the tranformators for the area and his power is way over 240 V.
This (to me) explained the series of malfunctioning devices and computers they are suffering. to troubleshoot your computer you have to swap everything and change it with working one. The best way to find out what is causing the problem in a computer is to swap everything out for another similar part that u know to be working in another computer. That's what i did with my com and all i can say is thank god for refunds. A friend of mine runs an online hardware shop, and I am always looking for stiff competitive prices when I do what I do. He helps me search for the best solution when I have to help one of our friends. 8 months ago at a microsoft partner meet a man asked me a direct question while I was yakking to a group including Mr. Alvez. He probably at first wanted Arlindo's ear but he had overheard what we talked about. He was, I figure.. wondering why he heard me say.. I am, JT, doom, PC, and the PC stands for Private Circuit or Consult. (untranslatable.. aka help a friend). Over the years I did some geeky tweaks. I helped get a "open project" open up. (hmm, it took me a while to have them partially disclose how it got done by them. I got myself in the getting to know beyond user level, and got in the team by prooving I was good enough. There were anonymous MVP and MSFT around and I had to stay away or stay clear of outright piracy or workarounds breaking copyright, and so on. So, some years later, I had done what I did for free, and the project is more open than ever, this man overheard what we talked about. I will not discuss what we then talked about, but I will tell you guys this. Do not take for granted that a theorem cannot be proved. Do not think that because you see no solution, there is none. Try to understand how to ask the question. Do not think we think like you think. You should understand there are more than one means to search/research. You should understand the better teacher is actually learning because pupils ask energising questions. You should know MSFT listens, top down, bottom up, to peers, kids, us, me, and you. You should not ever believe hardware vendors conspire against software vendors so as to have their penny saving masked chip uncompliant to operating system hardware Quality Standards harm stock or perception. Ya can ask us many things. YOU can help you help us. I remember a good many things I learned at CTH and some of those are in this topic. No burn mark? Well.. Then at least try it. I got some "tossed" ones alive..
Dead motherboard? Use your test fixture. You can have a DVDCD-RW and an old sata and old IDE HDD. I have had a lotta fun with "al-you-can-pack" driver collections. Some of the prepped drives booted up fine in a wildly different motherboard/CPU combination. Well.. Even had it bluescreened, I at least knew the thing got past POST. I am afraid there will always be more questions than clearcut answers. I am quite sure there are fewer clearcut questions than there are questions. Oh yeah, I learned from this topic. More than many would think. One Weird intel socket 775 3.2 Dualcore. The CPU itself has no pins. CPU gets tossed because it wont post on Known Good mobo..
it gets tossed out as not good, and all I see is fingerprint grease on the underside of that CPU. After cleansing, lint free, CPU tests fine in other new mobo. In original mobo, still no go, so mobo is getting removed from its box. I put it in fixing plank, and I B Damned, the thing boots. The solution to this has been adressed in this topic. Well, it turned out that the owner had tried to clean his weevils. His mistakes were almost deadly (they sure cost some). * 1; A new zalman 9700 (a flower.. not sure of exact model) on the mobo. Put rubber adhesive conical supports under RAM bridges. Them plastic DDR stiffeners will get teared loose if the OEM does NOT put all support studs and screws in place. DDR contact themselve have a couple millimeter, but the bridge is pinned to mobo and that connection can break by bending. Builder mistakes (too few screws) had made the owner desperate. Owner had put fingerprint greasemarks to bottom of CPU. .. before we got to do any hands on on this, we had a dead system, a desparate guy, and we had the luck to have a intro before, a talk with Fred and the Man, and discussion about what was already done before I first saw that guy. We would not have known detail had we not done mindbenders and questions while he was with us. Standards. What use are they if not adhered to? There is a standard about stiffness in the intel CPU socket. Add some heat, and resin based stuff weakens. Steel plate would not weaken much in stiffness until 246 centigrade, right? In standard cold deep molded autobody and folded case steel we are talking about construction stiffness, and a 46 elasticity number can have manifold when properly folded. Take it from me, that mobo resin is nowhere near those numbers, at 80 centigrade, and if the ManuFactor of a machine saves a few cent by not properly fixing all supports the mobo has only itself to stand up to the strains. The MF saving on the number of screws, screws ya, that mobo will bend beyond specs..
My computer start freezing up some time ago and now it freezes everytime I turn it on. It doens't matter what I'm doing the machine locks up. You can turn it on and leave it on and guaranteed in a half hour it locks up and you have to reboot to get it going again. It locks whether you are working on it or not.I've tried everything. I have a hardware monitor for temp and dont notice the CPU heating up or the CPUfan speed slowing down at all .I reformatted the hard drive, repartitioned and reloaded a fresh version of XP. I noticed running a memory test that the computer could especially lock up and I was running 256 megs of PC2100 (Viking) and I took that out and replaced it with 256 MB of Mushkin (also PC2100 256MB). The memory test ran fine with the new memory but then low and behold 20 minutes later the machine locked up again. I am running a SOYO P4VGA motherboard and a Pentium 4 2.4mhz 533 fsb processor. Both are only a few months old. I tested the processor with a stress test and it seems fine. I am running just XP on the machine with no additional software because at first I thought it might be a software issue. I've even dusted out the machine . I have also run ADAWARE and have found no malware on the machine. I had this problem with mine. Most likely the PSU, But i found that when i changed my Bios battery, it booted fine. But would go with the PSU. Last edited by victor.martin; February 3rd, 2011 at 10:50 AM.